We all need to be strong spiritually throughout our entire lifetime. 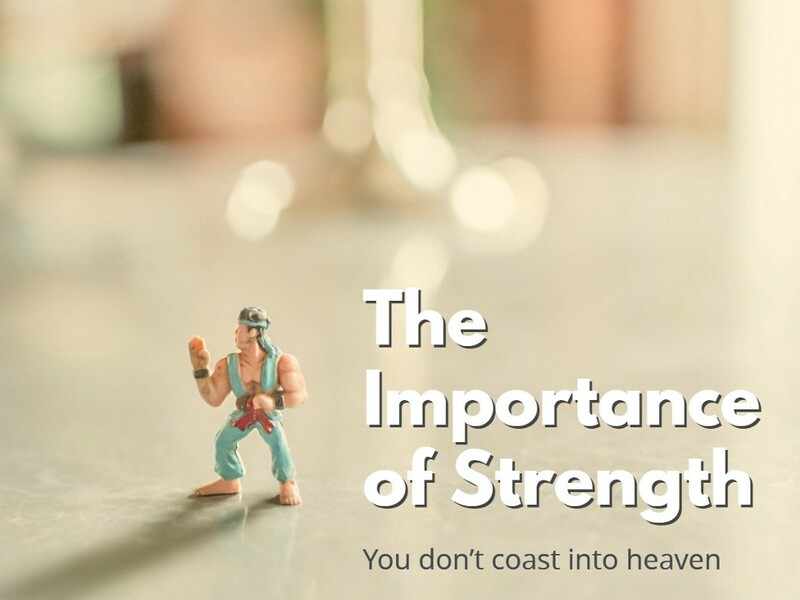 As we age, we grow physically weaker but we have the opportunity to grow stronger spiritually. Satan is always after us and if we think we have reached the point where we are strong enough, that’s when Satan has us. Be Strong. You don’t coast into heaven. Our power to do good is dependent upon the degree to which we allow truth to influence our own souls. 2 Tim 2:1 You then, my child, be strengthened by the grace that is in Christ Jesus. Col 1:28–29 Him we proclaim, warning everyone and teaching everyone with all wisdom, that we may present everyone mature in Christ. (29) For this I toil, struggling with all his energy that he powerfully works within me. 2 Tim 1:7 for God gave us a spirit not of fear but of power and love and self-control. 2. The source of strength is God and He has given us the tools to equip us for strength. Eph 6:10–20 Finally, be strong in the Lord and in the strength of his might. (11) Put on the whole armor of God, that you may be able to stand against the schemes of the devil. (12) For we do not wrestle against flesh and blood, but against the rulers, against the authorities, against the cosmic powers over this present darkness, against the spiritual forces of evil in the heavenly places. (13) Therefore take up the whole armor of God, that you may be able to withstand in the evil day, and having done all, to stand firm. (14) Stand therefore, having fastened on the belt of truth, and having put on the breastplate of righteousness, (15) and, as shoes for your feet, having put on the readiness given by the gospel of peace. (16) In all circumstances take up the shield of faith, with which you can extinguish all the flaming darts of the evil one; (17) and take the helmet of salvation, and the sword of the Spirit, which is the word of God, (18) praying at all times in the Spirit, with all prayer and supplication. To that end keep alert with all perseverance, making supplication for all the saints, (19) and also for me, that words may be given to me in opening my mouth boldly to proclaim the mystery of the gospel, (20) for which I am an ambassador in chains, that I may declare it boldly, as I ought to speak. 3. Teach others. It is not the sole responsibility of the preacher, the elders, the deacons or even just men to teach others. We are required to be faithful and part of our faithfulness is in teaching others. Anything that comes between us and our faithfulness to God will cost us our souls. Not everyone is going to listen and it is discouraging when you have spent so much time with someone and they reject it. Bu we use the strength of God to move on to the next soul until we find someone who will listen. 2 Tim 2:1–2 You then, my child, be strengthened by the grace that is in Christ Jesus, (2) and what you have heard from me in the presence of many witnesses entrust to faithful men who will be able to teach others also. 1 Cor 4:1–2 This is how one should regard us, as servants of Christ and stewards of the mysteries of God. (2) Moreover, it is required of stewards that they be found faithful. 4. What does it take? We each need the dedication of a good soldier. A soldier enlists for a period of time but the Christian enlists for life. When we become distracted by the cares of this world our effectiveness as soldiers of God is diminished. We also compete as athletes do, taking constant training and prayer to succeed at when the opportunities to strive for God arise. There is no such thing as a spare-time Christian. It takes labor and hard work to receive the rewards of your efforts. 2 Tim 2:3–6 Share in suffering as a good soldier of Christ Jesus. No soldier gets entangled in civilian pursuits, since his aim is to please the one who enlisted him. An athlete is not crowned unless he competes according to the rules. It is the hard-working farmer who ought to have the first share of the crops. The soldier submits to the discipline of his superiors. The athlete trains continually for the prize. The farmer labors continually to see the fruits of his crop. These are sound principles of Christian dedication that will grow the church. Churches that grow both numerically and spiritually are those who intentionally work to strengthen each other. Encourage one another and grow together so that you can carry out the will of God in your life.